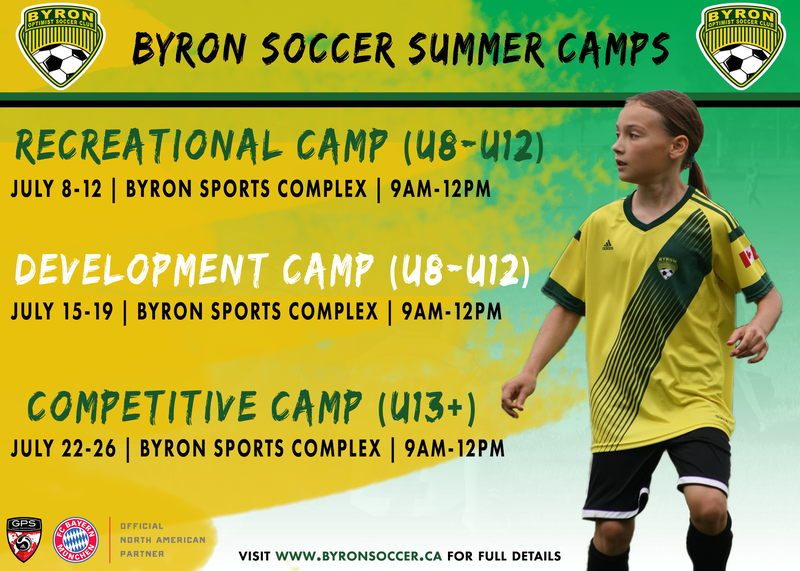 The Byron Soccer Summer Camps are taught at a level where children will be challenged during the week and have an incredible soccer experience at the same time. Each day will be focused on one specific theme to keep the players immersed in the world of soccer. The children will enjoy ample game time each day to practice and perfect the skills that they have learned. Our camps adheres to Canada Soccer’s and Ontario Soccer's Long-Term Player Development Model (LTPD) and promises exceptional instruction in a fun and safe soccer environment. We want to make sure we give all players the opportunity to enjoy this Summer Camp. Our GPS Professional staff is trained to provide the Summer Camp with a plan to maximize the skill development and make the camp enjoyable for all over the week. We hope that our players who participate in our camp grow as players, people and become active for life through the sport of soccer.